We are delighted to announce that apa Architects and Project Managers have successfully completed our Te Toke Marae Wharekai development. Te Toke Marae Trustees and apa Architects & Project Managers started the journey in 2013 after successfully wining a feasibility study grant. We looked at several options, the outcome of which was to re-use and extend the existing building as well as refreshing the interiors. This was an excellent solution which ensured that the re-development stayed on budget. To fully appreciate the final solution, we invite you to compare the two before and three after images. Between the back drop of Mt Tauhara and flat plains of small township Reporoa lies stands a Marae of people of Te Toke. The Marae has clear sight of the legendary Mount Tauhara but the existing Architecture was not responsive. “The warrior mountains of Taranaki, Pūtauaki, Tongariro and Tauhara were deeply in love with Pīhanga the mountain that stands above Turangi at the southern end of Lake Taupō. A battle erupted to win Pīhanga’s favour and the victor was Tongariro. At their defeat, the other mountains decided to leave Tongariro’s domain, travelling as far away as they could in the course of one night. Taranaki fled west towards the setting sun, and Pūtauaki and Tauhara fled north towards the sunrise. Pūtauaki moved fast and is now located near Whakatane and is also known as Mt Edgecumbe. But Tauhara was sad and with a heavy heart he traveled reluctantly. When overtaken by dawn he had only reached the north eastern shore of Lake Taupō. Here he stands to this day looking mournfully across the lake towards his lost love, Pīhanga. “Tauhara” is Māori for “alone, or isolated”. “Our Tupuna Ariki Tahu Matua (Ngāti Tahu) arrived in Aotearoa before the arrival of the Great Migration of the seven waka from Hawaiiki; our Tupuna Whaoa (Ngāti Whaoa) is some generations younger. Whaoa descends from Tahu Matua on his mother’s side, Hinewai; and he descends from Atuamatua on his father’s side, Paengatu. Through successive generations of inter-marriage with neighbouring iwi, our tribal members also trace descent from ancestors who arrived on the Arawa, Mataatua and Tainui waka. As a tribe, we derive our name from our ancestors Tahu Matua and Whaoa. With such beautiful and unique history of people and lovely location of the site came a brief which at first was practically impossible. 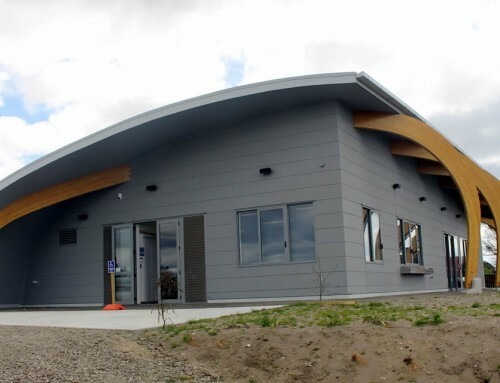 The Marae wanted to relocate the existing dining hall building on site somewhere else for other use and get a completely new dining hall facility to sit over 200 people and new fully equipped commercial grade Marae kitchen. Apa Architects conducted 3 options master planning at feasibility study stage and quickly identified $450,000 budget had very limited options. 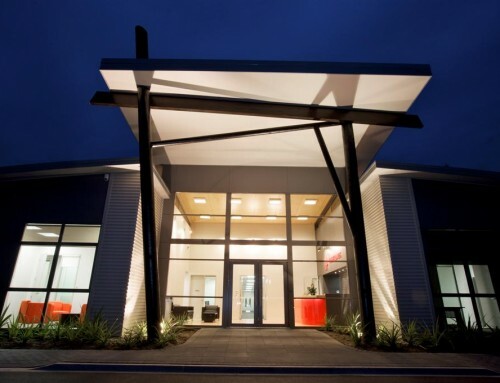 The option we identified that was feasible was of retaining existing building , extending out, refurbishing the kitchen facilities and interiors, re dressing the cladding of existing, structurally and services upgrading, and providing a veranda with multipurpose use. 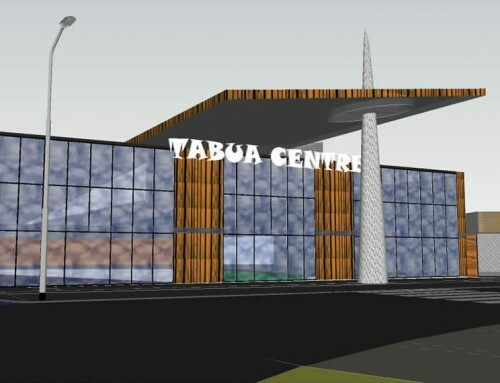 The planning layout of an existing building on a Marae site cannot be in isolation to other buildings on site. Therefore, very early on we identified the location of the veranda, extended floor space of the dining hall and also what if at all was to be done with formal welcomes, entry way, and fire egress. The existing building at the time was not very responsive to any of these matters in an effective manner and so we extended the brief with client to see that could be included. We identified that road face elevation to be dressed well whilst the veranda would engage people in semi casual with courtyard creation of space in between meeting house and dining hall. The roof pitch falling towards the long end of the building meant that the veranda could not be practically roofed with height conflicts. The design solution thus sought was one that responded with meaningful architecture to communicate with the Mount Tauhara, the sky and wind as much as it was going to be responsive to the land on which it stood. The veranda roof falls back from out to in towards the building and the posts that carry the veranda beam are angled and protruding beyond the roof line, finished with stainless steel caps. The veranda roof structure is singularly supported by these timber poles without any connection to the building. This not only is structural marvel for earthquake reasons but also an architectural statement. Only the reader can put their own meaning depending on time of the day or season in the year. The formal spacing of the poles and alignment of the stainless steel capping angled to face the sky depict the idea of warriors dressed ready to perform haka or other formality. 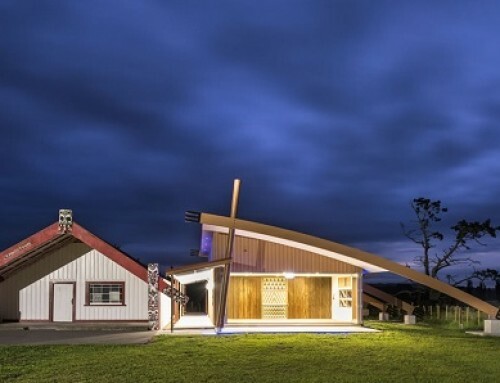 With the veranda roof and poles facing towards the mount Tauhara, the Architectural connection and communication between the Marae buildings and the mount is now begun. Primary material for the Project is all timber with understanding that timber is very accessible in the region and recycling and supporting the local forest industry. The poles further highlight similarity of tall trees in the neighbourhood by their lean and protruding beyond the roof line. Paint rather than stain is selected because in community buildings the frequent requirement of re staining can be a costly and time consuming exercise for Trustees who are volunteers. 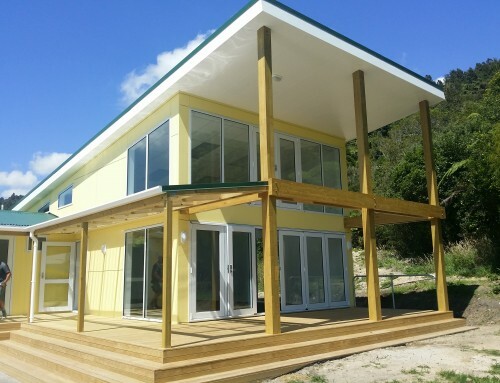 Painted timber still gives you timber look if you choose right colour but saves marae costs of maintenance in the long run. Stainless steel kitchen and hard glaze linings also provide easy cleaning and longer lasting interiors. The Marae recycles its rainwater and is self-reliant on waste disposal. Light sensors and LEDs are used to conserve electricity. Extra insulation was added and the building was positioned with veranda slab to act as a heat sink. The upgrades of grease trap have further provided extra resource for grey water use in irrigation on the Marae. The environmentally friendly kitchen appliances purchased have further aided on reduction of energy consumption. 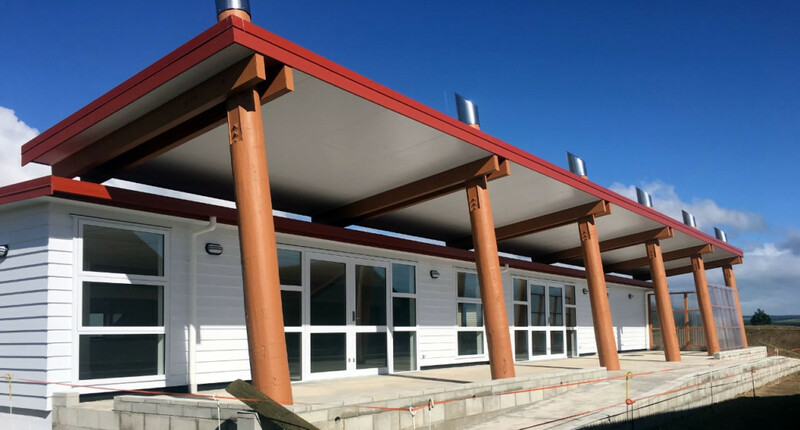 It was a pleasure to see pride, ownership and satisfaction on clients’ faces – whole community of Te Toke Marae – with their project finishing in the tight budget and in time.